Pipe ends are sometimes capped to protect against physical damage and intrusion of foreign objects during storage and shipping. Cortec’s CorroLogic® CorrPlug® pipe caps – heavy wall black polyethylene pipe caps containing proprietary Vapor phase Corrosion Inhibitors – incorporate VpCI® corrosion protection technology directly into the plastic cover. 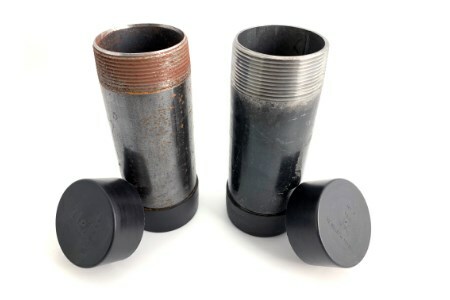 The pipe caps protect pipe threads, pipe ends, and other tubular objects from corrosion, mechanical damage, and contamination during transit, handling, and storage. The caps are specially designed for easy installation and removal and offer protection all the way to the last pipe thread. This helps eliminate extra labour on pipe ends that might otherwise need to be cleaned off before being joined together. During humidity testing, pipe threads capped with a CorroLogic CorrPlug showed a significant advantage in corrosion protection compared to pipes capped with regular plastic containing no corrosion inhibitors. CorroLogic CorrPlug pipe caps serve an additional purpose when used in combination with VpCI-337, VpCI pouches, or CorroLogic Tube Strips. These products emit Vapor phase Corrosion Inhibitors that form a protective molecular layer on the internal surfaces of pipe walls. In order to be effective, the Vapor phase Corrosion Inhibitors must be trapped inside the void. CorroLogic CorrPlug pipe caps offer an easy way to keep the protective vapours from escaping while also protecting pipe ends from corrosion. Pipes that are protected inside and out with VpCI Technology will be doubly prepared to face humidity swings, condensation, precipitation, and other harsh elements frequently encountered during outdoor shipping and storage. CorroLogic CorrPlug pipe caps are made to order in most standard NPT pipe sizes ranging from 0.25 to 64 in. (0.6 cm to 1.6 m) in diameter, making them applicable for a broad range of small to large pipes. They protect carbon steel, stainless steel, copper, brass, and aluminium. CorroLogic CorrPlug pipe caps are particularly suited to extensive pipe layup projects or mass shipments of pipes where a large minimum order quantity is required.